We love a bit of drama and the 1933 Merlot Lipstick by Bésame certainly has that, this brown red shade is an ideal colour for everyday wear for any skin tone. A true replica of a colour from 1933 this neutral tone screams 1930s glamour! Ricinus Communis (Castor) Seed Oil, Caprylic Capric Tryglyceride, Trioctyldodecyl Citrate, Octyldodecanol, Ozokerite Wax, Kaolin, Ethylhexyl Palmitate, Bis-Diglyceryl Polyacyladipate – 1, Bis-Diglyceryl Polyacyladipate – 2, Cetyl Palmitate, Myristyl Lactate, Beeswax, Copernicia Cerifera (Carnauba) Wax, Euphorbia Cerifera (Candelilla) Wax, Microcrystalline Wax, Thihydroxystearin, Tocopheryl Acetate, Tocopherol, Helianthus Annuus (Sunflower) Seed Oil, Aloe Barbadensis Leaf Extract, Chamomilla Recutita (Matricaria) Flower Extract, Macadamia Ternifolia Seed Oil, Carpylyl Glycol, Phenoxyethanol, Ethyl Vanillin. May Contain: Mica (CI 77019), Titanium Dioxide (CI 77891), Iron Oxide (CI 77491), Iron Oxide (CI77492), Iron Oxide (CI 77499), Carmine (CI 75470), Yellow 5 Lake (CI 19140), Red 7 Lake (CI 15850:I), Red 6 Barium Lake (CI 15850), Red 27 Aluminum Lake (CI 45410), Red 28 Aluminum Lake (CI 45410), Blue 1 Lake (CI 42090:2). Love the look? 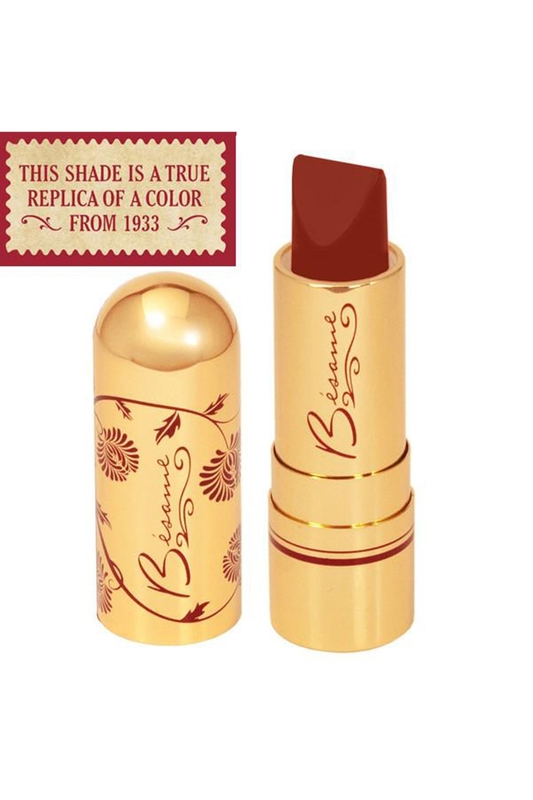 Why not try the 1933 Merlot Lipstick by Bésame!